Create your very own front porch Welcome sign in this fun, 2 hour, all level workshop! 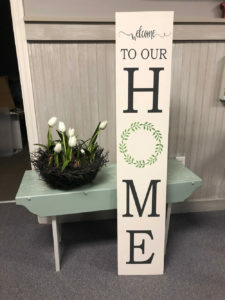 You will paint and stencil a 4 foot wood sign that’s 10″ wide using our Country Chic Paint products in your choice of colors. In addition to painting your sign, you will learn our stenciling tips and tricks to make your project a success. $45 (+tax) includes all materials to complete one side of your new sign, an instructional hand out, a 10% off coupon to be used on any Country Chic products following the workshop, and refreshments. *Due to limited class size, payment with registration is required to hold your spot in the class. You can register online or at either shop location, or by call 865-233-3393. Class fees are non-refundable but can be applied to a future workshop held during the next 30 days if cancellation is made 48 hours prior to the class including our scheduled walk-in sessions.